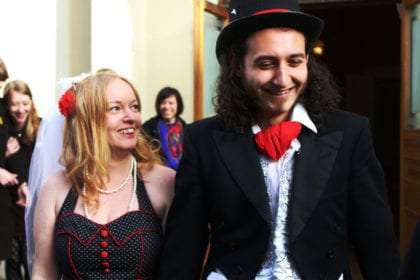 I met the man who would become my husband in late 2012, while hitch­hiking to Iran. I had been on the road more often than not for several years already, and could feel myself beginning to weary. It was late autumn and I had reached Yerevan, the capital city of the Republic of Armenia. I was waiting for my couchsurfing host to close up the bar he was managing in the centre of town, feeling agitated by the smoke, the noise, and the stinging in my tired eyes. Hrach came in late, having just finished work at a call centre. He was a friend of the lover of my host. I can’t remember quite how the conversation began, only that we were soon exchanging views about everything from social movements to occult symbology, as though we’d known one another for decades. We moved on to another bar when my host and his friend went home, then arranged to meet up again the following day. Nine months later, we boarded a plane together in Istanbul, and landed at Gatwick airport. At that time, we didn’t expect to be in the UK longer than a few months. But plans change, as every traveller knows. Once we had decided to try to stay together in the UK, a long winding headache of bureaucracy and unforeseen complications rose before us. A year and a month before we landed at Gatwick Airport, a new rule had come into effect in British immigration law, setting a minimum income of £18,600 for the British partner of anyone applying for a spouse visa. I recently published a long post about this on my other blog, so I won’t bore you with the details here. The upshot is that after battling bureaucracy for months, first to stay in the UK, and then to leave it without using a plane, we decided to give in. I have always felt that flying isn’t really travelling. It feels a bit like cheating, but we have no other choice. We’re on our way back to Yerevan, via Istanbul, to apply for a visa to enter Europe. 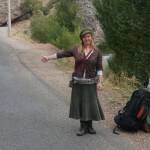 We will meander our way slowly to Spain from there, hitchhiking of course. Once the decision was made and the flight tickets bought, I felt excitement slowly swell, and the tinglings of an itch begin in the soles of my feet. The road is calling. Hopefully we can go back home to England at some point in the future, but for now we’re happy to be wherever we are going, as long as we’re going there together. And so it is that we come to board another plane that takes us away from that big island in the North West of Europe, to the place where continents meet. We fly through a long sunset and into twilight, until the light peeking over the horizon is finally snuffed out. A trillion lights glitter below us as our plane spirals around and down to greet the sprawling metropolis of Istanbul. A whole new adventure is about to begin.